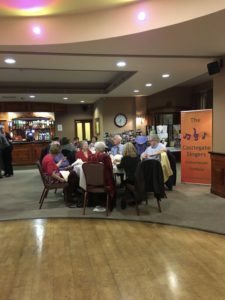 We celebrated in style on Saturday 15th October at Hundith Hill Hotel with an amazing buffet supper and entertainment from Susy Braidwood, Laurie Mansfield, Simone Armstrong, Anne Marie Kerr and the Choir conducted by Founder Richard Bennett and our current Choir Director Val Hetherington. We also raised £180 for Ovarian Cancer Research through the generous donations placed in the bucket!!! !